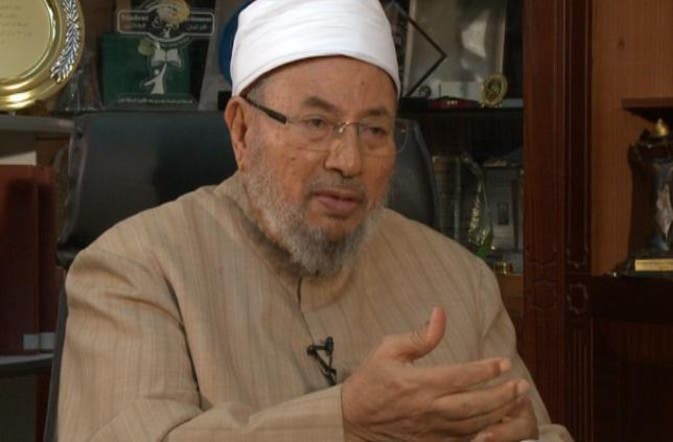 In an interview with Al Arabiya aired on Sunday, Sheikh Yusuf al-Qaradawi, president of the International Union of Muslim Scholars, slammed Lebanese Hezbollah group as “party of Satan” that seeks to “sow discord” among Muslims. Sheikh Qaradawi lamented his previous defense of Hezbollah and Iran at a time when major Muslim scholars, notably in Saudi Arabia, had voiced skepticism over the militia group’s plotting in the region. “When Hezbollah was fighting against Israel, I defended it. I stood against the Muslim scholars in Saudi Arabia, the most renowned scholars who warned us against Hezbollah,” Sheikh Qaradawi said. “They warned us against Hezbollah’s plans to sow discord. They warned us against their ideology and intentions. I stood up and defended them [Hezbollah],” he added. He described the group, whose name means in Arabic the Party of God, as a “party of Satan” that seeks to sow discord in the Muslim land. “Those who are fighting against the Syrian people and call themselves Hezbollah (Party of God) in Arabic are the Party of Satan,” he said. The prominent Muslim scholar declared that Saudi religious scholars were “more mature and knowledgeable” about his Hezbollah and Iran than him. “I believed things were as they seemed to be. I wanted to unite all Muslims; Muslims fighting against Israel, how can I support Israel? But it seems that the scholars –may they rest in peace if they died, and may God bless them if they are still alive – they were smarter than me,” he said. “Those, whom I defended, went and killed their brothers in Syria. We thought that they were our brothers, but apparently they are not,” he added.